April 12, 2011 - They’re heard before they’re ever seen. Even over the engines of an Airbus A310, a distinct roar causes a vibration a person can feel in their chest, prompting them to look out the window and find that the airplane they’re sitting in is now sharing airspace with an F-16 fighter jet. Close enough to see that, even as they’ve turned to look at the fighter’s helmeted pilot, that pilot has turned to look at them. Such was the situation March 15 for a Canadian Airbus A310 jetliner flying over the Gulf of Mexico. Responding to a report of a disturbance in the cockpit, two F-16s from Detachment 1 of the 138th Fighter Wing intercepted the aircraft and attempted to make contact with the flight crew. In the Airbus’s cockpit, a tall, older man sat behind the pilots, telling them what to say and watching the fighters closely to see what they would do, how they would react, what they would say. This man, however, was no unruly passenger or terrorist. He was Air Force Col. Andy Morgan, the North American Aerospace Defense Command Inspector General. As he listened to the fighter pilots interact with the Airbus’s Canadian military flight crew, he was silently grading the pilots of Det. 1, making certain they followed the procedures NORAD set down in how to go about intercepting an airliner in this situation. Morgan’s flight was only a small part of a two-day, no-notice Alert Force Evaluation of Det. 1, based at Ellington Field, Texas. Only one of 20 evaluations his office will conduct this year and nearly three months in the making, Det. 1’s evaluation, like every evaluation, was a top-to-bottom inspection of the alert facility’s abilities to execute a launch and intercept mission. “The purpose is to ensure units are able to go out and execute the mission,” Morgan said. “It lets us make sure they’re keeping their skill level where it needs to be.” To make this determination, the NORAD IG Office sends teams of evaluators to every alert facility and look at each area of the alert mission. These areas include command and control, operations, maintenance and security. Where the evaluation takes place and the scenario they’re being graded on can determine what organizations have to be involved. In the 138th’s evaluation, there was coordination with the Federal Aviation Administration to coordinate the airspace, the Canadian military offered a CC-150 aircraft to use as a track of interest, and an E-3 airborne warning and control aircraft from Tinker Air Force Base, Okla., flew to the area to provide command and control. Morgan said even more organizations come together for other evaluations. No warning, with all the coordination that goes into an evaluation, it may seem that everyone in the government is involved with the planning… with one notable exception: The unit being evaluated. If everything goes right, the alert facility being evaluated will have no idea an evaluation is planned until the IG team knocks on the facility’s front door. In other exercises not contingent on secrecy, such as FALCON VIRGO and AMALGAM ARROW exercises, NORAD sends out press releases days in advance so that people on the ground won’t see an aircraft being chased by fighters and assume the worst. However, in the case of these no-notice evaluations, appropriately code-named AMALGAM MUTE, releases are not sent out until only a few hours before the evaluation begins. Once the notice is given, IG inspectors spread out across the facility from the command post to the hangar, and, in Morgan’s case, the air, to watch how the alert facility personnel react. Some will inspect the plans and documents that form the basis of how the unit is run. A failure in one area can lead to a failure of the entire evaluation. Although very rare, should a failure occur, NORAD takes steps to ensure there are no gaps in North America’s air defenses. A re-evaluation is conducted looking at the full scope of the unit’s mission even if the original infraction is small. The most vital mission, while evaluations can be onerous on the inspectors, the alert crews and the people living in the surrounding area, they play a vital role in maintaining the defense of the homeland, the number one mission of the Department of Defense. The ability to meet the various potential threats the homeland could face cannot be assumed, and although they are rare, failures do occur. If those failures are to occur, it is better that they occur during an evaluation rather than a real-world mission. That’s why, Sherman said, these evaluations are so important. Air Force Master Sgt. Phillip Rangel, NORAD IG Superintendent of Force Protection, is the physical security evaluator in charge of inspecting security forces personnel, physical barriers, electronic sensors and sensor alarms. A veteran of more than 80 such evaluations, he said they show the American and Canadian people that NORAD takes their heavy responsibility of defending the U.S. and Canada seriously. They also give the alert facilities a mark to strive for. “They give the tax payers for two nations the biggest bang for their buck and a sense that their militaries care about their well-being,” he said. 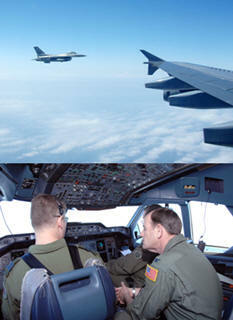 “During my tenure, I have seen a vast improvement regarding the security of the Air Sovereignty Alert mission. If the evaluations were not conducted, the unit personnel would not have a goal to strive for, which in turn has a significant impact on the mission. Everyone wants to do great.” Morgan said that although the NORAD IG’s job has scaled down since the end of the Cold War when nearly 5,000 aircraft were assigned to the NORAD mission, the potential threats the U.S. and Canada face require the IG continue to perform evaluations as often and as efficiently as possible.